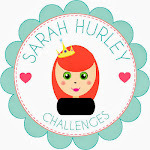 Sarah Hurley 365 (Formerly Sarah Hurley Challenges): Documented December - THE BIG DAY! Documented December - THE BIG DAY! I just wanted to take this opportunity to wish you a MASSIVE Happy Christmas from everyone at Hurley HQ! I'd also like to thank my fabulous team for their inspiration throughout December - they've come up with so many fantastic projects, it's amazing! If you're chilling out after your dinner while you read this then why not have a flick through our latest issue of the Lookbook, once again my lovely girls excelled themselves and there are some cracking projects for you to have a flick through. I'll back in a couple of days with my round up of the year and a little something for you if you've been following along with the calendar posts - in the meantime, I'll leave you to your Turkey and Christmas Pud - my lovely team will be posting throughout the day with their messages and projects if you're having a crafty Christmas! Documented December - Day Nine - Christmas Films! Documented December - Day Four - Letter to Santa! How to stamp a wreath. Documented December - Day Three - Making a List! Documented December - Day Two - Trim the Tree! Documented December - Day One - Deck the Halls!